If you are learning Ukrainian, you should plan a trip to Ukraine to practice. 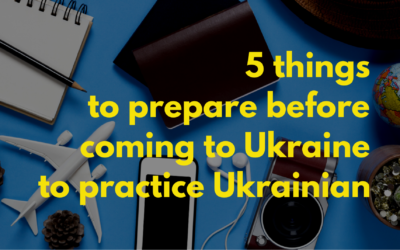 And when you decide to go for it, here is a short check-list of the things to prepare before coming to Ukraine. 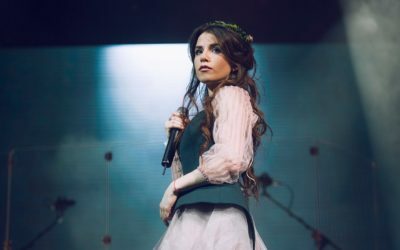 We have chosen best Ukrainian songs with video clips of 2018! Listen, watch and enjoy! 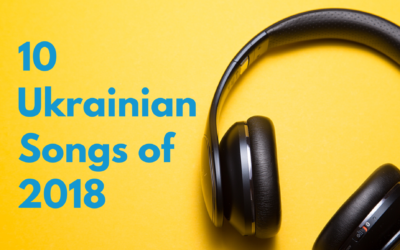 Then tell us which of 10 Ukrainian songs of 2018 you liked the most! 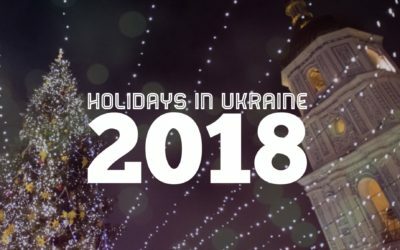 Discover the list of holidays in Ukraine for the year 2018! 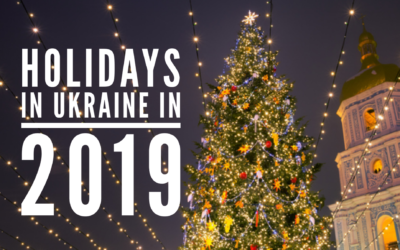 It includes secular and religious, official (non-working) and unofficial holidays – ones that are known by all Ukrainians. Save the dates! Христина Соловій is a young Ukrainian pop star with a beautiful voice. 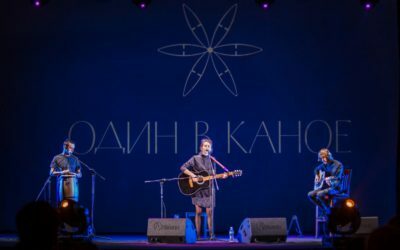 She has shown her flair with the help of Святослав Вакарчук, the frontman of Океан Ельзи (we have their songs translated too). 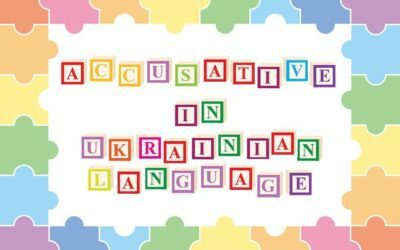 Learn about adjectives and adverbs of the same stem in Ukrainian, and how to form an adverb from an adjective. Practice pronunciation with our recordings! 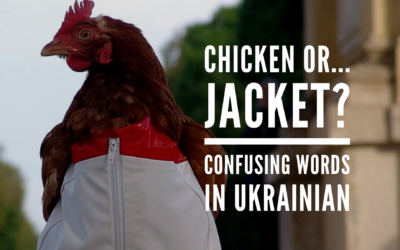 Learn the difference between confusing Ukrainian words! 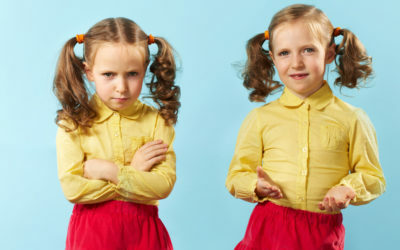 Яка різниця… – What is the difference between вчитель – викладач, зараз – тепер, любити – кохати? 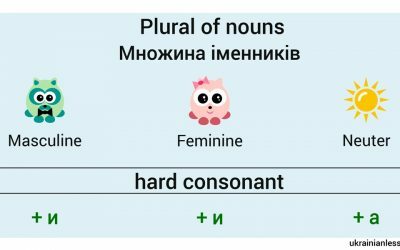 Learn особливі форми множини іменників – special forms of plural of Ukrainian nouns. You can practice your pronunciation with our recordings. 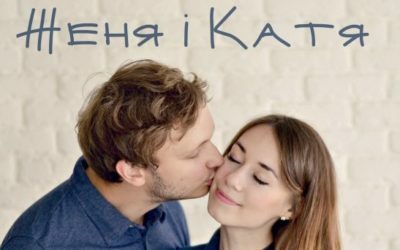 Женя і Катя is a romantic Ukrainian band with sweet & tender music. Listen to their Втомлене місто – a beautiful song easy to master for Ukrainian learners. Learn basic напрямки – directions in Ukrainian! Look at the picture, then master your pronunciation repeating after the native speaker! 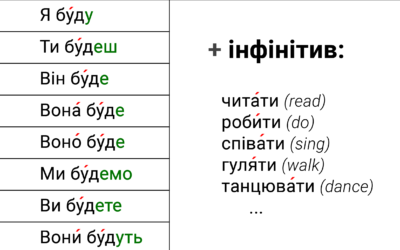 Sounds х, г, ґ in Ukrainian are not simple to master. 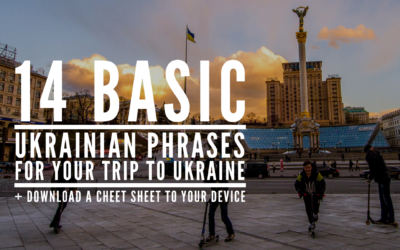 Find examples of Ukrainian words for each of these sounds, and practice your pronunciation with audio! 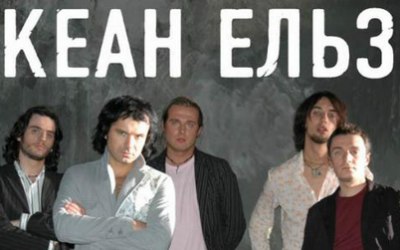 Meet Ukrainian Pop Rock in our Songs section! Here is one of the most famous Ukrainian modern bands Антитіла – Antibody with their song TDME or Там, де ми є – Whereon We Are. Антитіла is very popular among Ukrainian teenagers, and you can listen to their songs on our radio stations quite often. You have already been introduced to some vocabulary related to the kitchen. 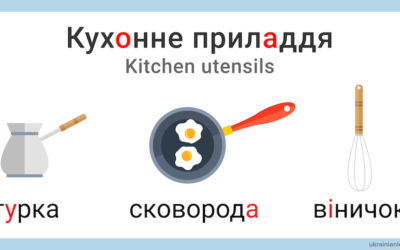 Today we will learn кухонне приладдя – kitchen utensils in Ukrainian! Don’t forget to practice your pronunciation with our recordings. If you are learning Ukrainian, you must get regular practice. One of the best ways I have discovered to learn my languages is to connect with people to talk to or a language teacher on the Internet. 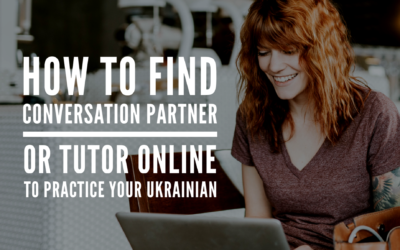 Learn how to find Ukrainian Conversation Partner / Tutor Online! 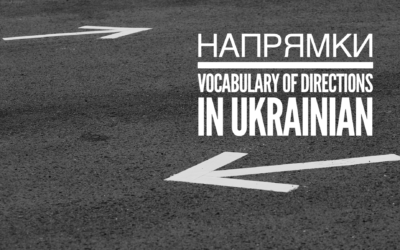 Just like “dessert” and “desert” in English, there are some confusing Ukrainian words that drive learners crazy. 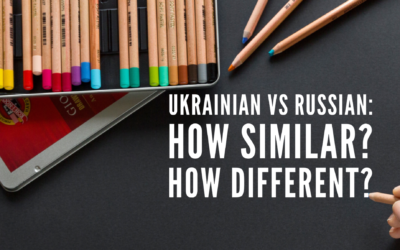 Take a look at the difference between those common confusing Ukrainian words that sound alike, listen to the pronunciation and say them aloud. Then, start using them! 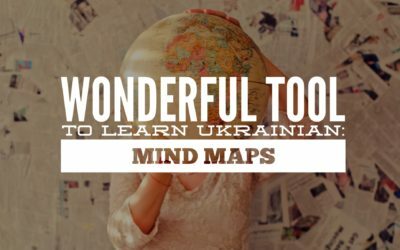 Make learning Ukrainian easier – create mind maps! This is a wonderful way to memorize difficult rules in an easy, funny, and colorful way. Mind maps help your mind to structure all information without overloading it with the unnecessary things. 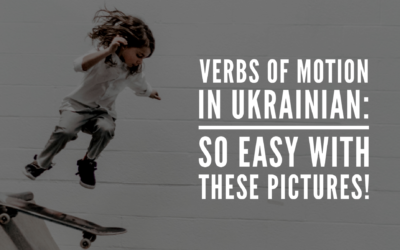 Verbs of Motion in Ukrainian: So Easy with These Pictures! 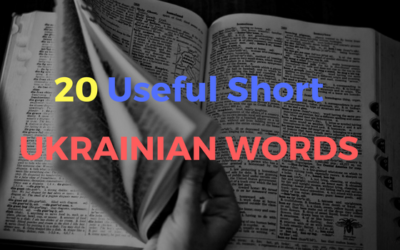 Take a look at 100 of the most common words in Ukrainian. If you are a beginner in learning Ukrainian, start with those words. If you’ve been learning for a while, check if you know them all. 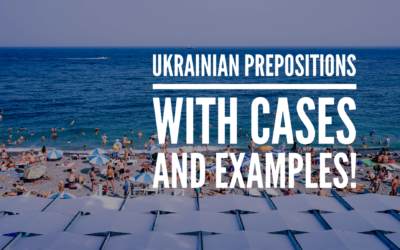 😉 We have also prepared some great extras to boost your Ukrainian vocabulary. 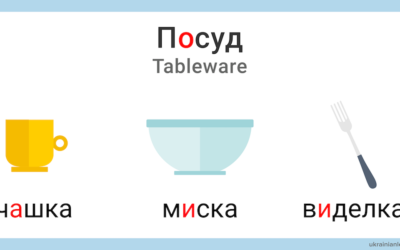 Do you want to know the names of посуд – tableware in Ukrainian? Look at the picture and listen to the pronunciation below! 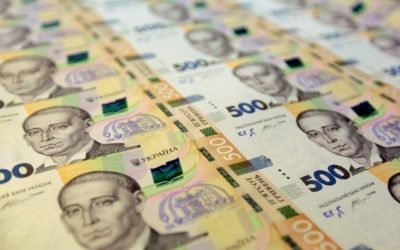 Get acquainted with personalities and places depicted on the Ukrainian banknotes, find out the etymology of the Ukrainian currency name and other interesting facts! At the end take a virtual tour of The Museum of Money of the National Bank of Ukraine and take the quiz! 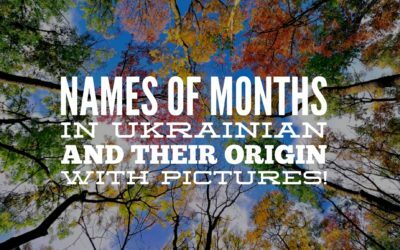 The months in Ukrainian have their own unique origin. That is why English, German, Russian or any other language will not help you in learning them (unless you know Polish or Belorussian). But don’t worry! Each month has an extremely clear name, which is connected to nature or agriculture. It is easy to remember them understanding the etymology. Today we are going to explain to you why Ukrainian moths are called in such a fancy way and how to learn them easily. This will be a long travel. Let’s go! 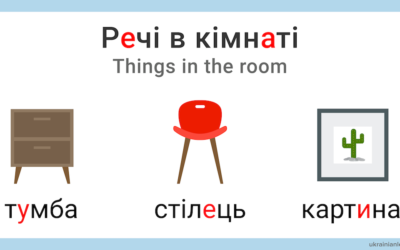 Learn things in the room in Ukrainian with us! You will easily describe your room in Ukrainian looking at the picture. What things do you have in your room? 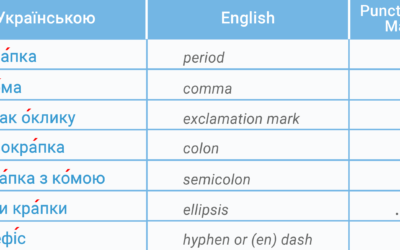 Would you like to learn the Ukrainian punctuation marks? You can start with the names of the marks before you move to the rules. This is the official Ukrainian to Latin transliteration. 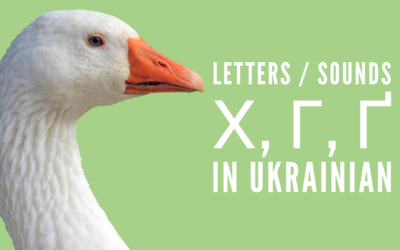 Have a look at how the Latin letters correlate with the Cyrillic alphabet. 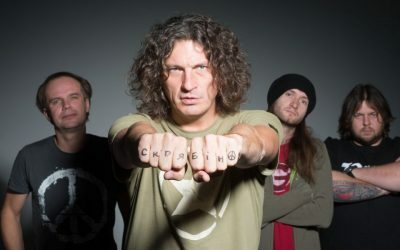 Друга ріка is a Ukrainian rock band which became popular in the 2000s.Their music is not very hard, so they are well-known among people with different tastes. 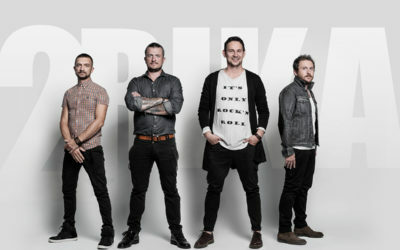 Sometimes their style is determined as Britpop, but the band definitely has its own style. Let’s talk about осінь – autumn. In Ukraine, this season is amazing and colorful. Look at the picture and learn autumn vocabulary in Ukrainian. Listen to the words being pronounced and repeat after the native speaker. Let’s have a rest a little bit from the difficult rules and learn how to say too much in Ukrainian. “Too much” has two forms – simple and complex, which are interchangeable. 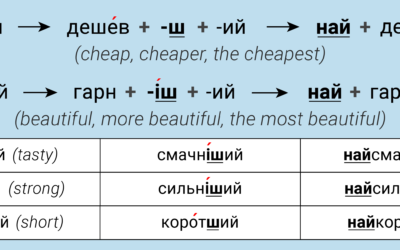 You should add the word “занадто” to an adjective or adverb or use the prefix за- before the word. It is simple, just try! Are you interested in Ukraine, its history, and culture? Then you must listen to the Ukrainian national anthem and get to know it with the English translation. 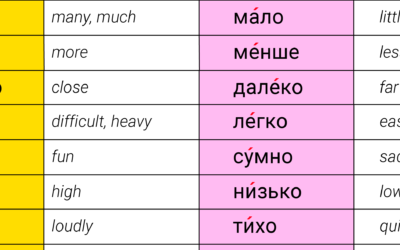 The adverbs – прислівники in Ukrainian language have only one form, which is used in every situation. 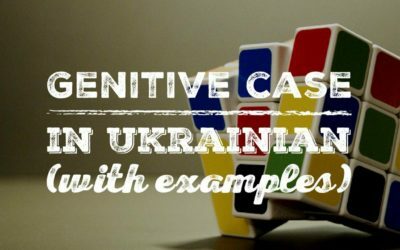 Learn some of the most common Ukrainian adverbs. Lviv is a city of various cultural sightseeings. 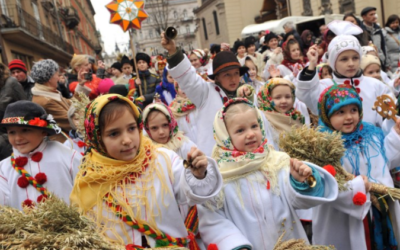 Here is Ukrainian Lessons Cultural Guide, where we collected the best places to visit in Lviv. Let’s move on and find out how to compare them! There are three degrees of comparisons in Ukrainian, as in English language. Enjoy the voice of Святослав Вакарчук and the wonderful Ukrainian music! Do you know any homonyms in your language? These words sound exactly the same but mean absolutely different things. 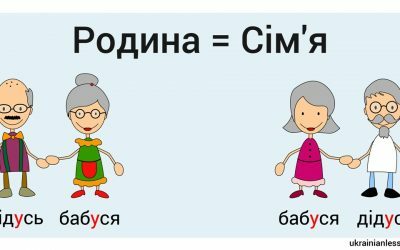 Learn some homonyms in Ukrainian with pictures at our blog today! Make your vocabulary more various! It is difficult sometimes to find synonyms and replace a simple word in a foreign language. 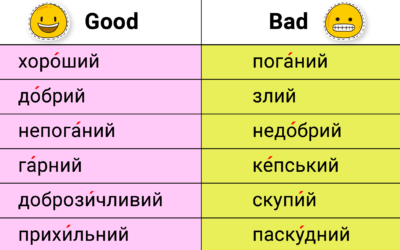 Practice 30 ways to say good and bad in Ukrainian and find the best adjectives to express your feelings! 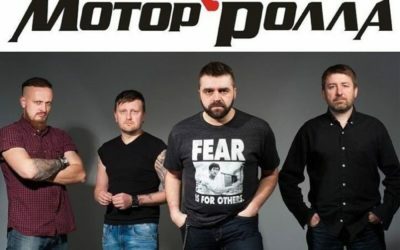 Enjoy Ukrainian song from the rock band Мотор’ролла! This band has its own unique singing style, which is impossible to forget. 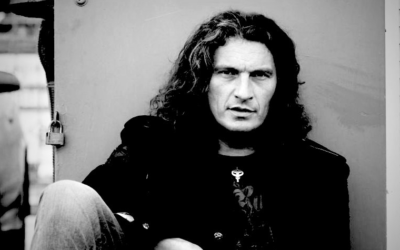 You will easily understand most of the lyrics because the front man of Мотор’ролла, Сергій Присяжний, sings quite clearly. Восьмий колір is their most famous single, which tells the love story full of tenderness and self-sacrifice. Despite the quick and loud music, Мотор’ролла talks about some eternal feelings. 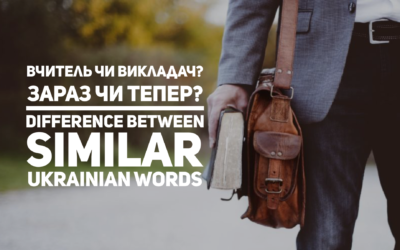 There are so many short words in Ukrainian language that it is too easy to mix them up, especially if you ask some questions. Як тебе звати? – What is your name? Яка твоя улюбена їжа? – What is your favorite food? Скільки це коштує? – How much is this? Questions are all around us, and it is impossible to speak the language without them. 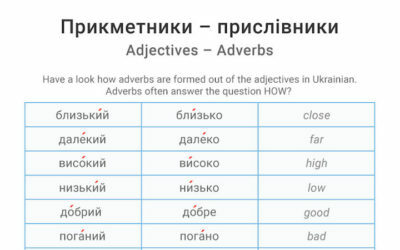 As you see, some similar English question words might be different in Ukrainian. 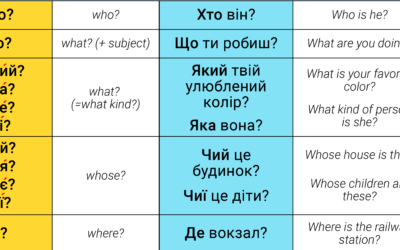 That is why today we will learn basic question words in Ukrainian for you to communicate with people better. Чому ви вивчаєте українську мову? Що вам подобається в ній набільше? We will be happy to read the answers in the comments below! 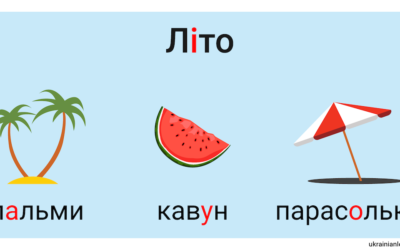 Summer in Ukrainian is called літо! It is the season of holidays, the sun, and rest. 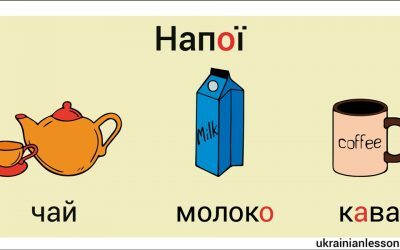 Have a look at summer vocabulary in Ukrainian and learn how to say the most common summer words here. Also, practice your pronunciation with our recordings! 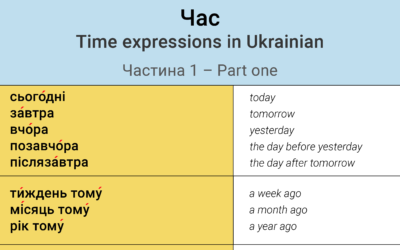 To ask for time in Ukrainian, we use the phrase Котра година? – What time is it? The answer to this question contains two parts, as in any language. Firstly we talk about година – an hour. 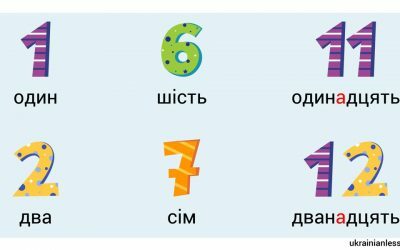 We use a special type of numbers for this purpose, порядкові числівники – ordinal numbers. 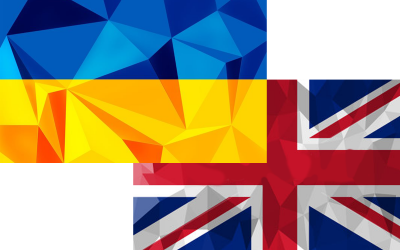 Learn more about ordinal numbers in Ukrainian in our article. 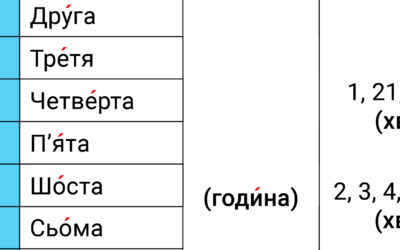 Explore two types of the майбутній час – Future Tense in Ukrainian in tables! Lviv is the capital of Ukrainian food tourism. 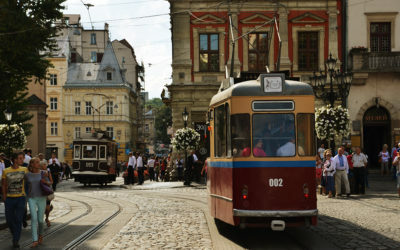 Due to the variety of nationalities, which brought to this city a part of the unique cuisine, Lviv is famous for the Ukrainian, Polish, Austrian, and Jewish dishes and drinks. 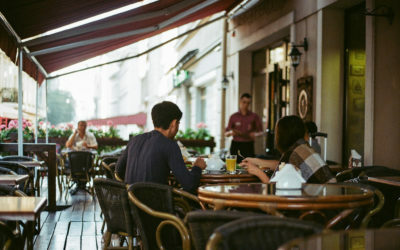 There are so many different cafes, restaurants, and snack bars that it is impossible to visit all of them even if you live in Lviv for years. That is why we have created Food Guide to Lviv for you not to miss the important parts of the city culture. Be attentive to the exceptions! Some of the ordinal numbers from 1 to 10 can change their forms in an unusual way. Look at the picture and repeat. 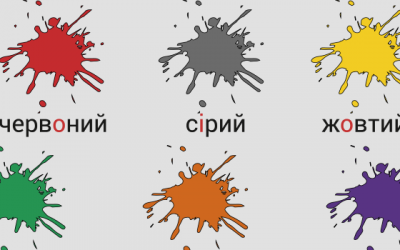 It is about time to learn a new type of words – Ukrainian adjectives. They answer the question який? – which? and show the characteristic of the subject. Here are some common opposites for you to improve your vocabulary! Each of them has a different ending according to the gender of a noun the adjective refers to. Sometimes short Ukrainian words can get more tricky than the normal ones. You can easily mix them up or confuse with the words from another foreign language. Also, these could be the first Ukrainian words you could learn as they are so easy to pronounce. It is весна – spring now! 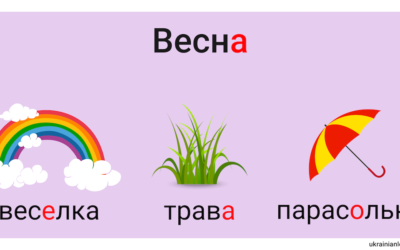 Let’s learn some words from spring vocabulary in Ukrainian. Listen to the pronunciation of them below. Have a good time! 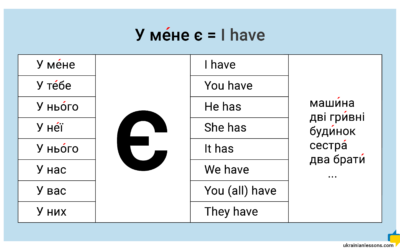 In this short lesson, you will learn the most common way to say I have in Ukrainian and different forms of the pronouns used. 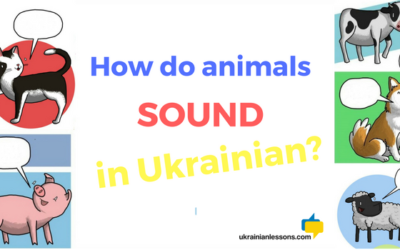 How do animals sound in Ukrainian? One of the first things we learn as babies are the sounds that animals make, but did you know that these sounds are different in every language? Here is how animals sound in Ukrainian! The name of Олександр Пономарьов may sound new for you. This Ukrainian song is about two people who are totally different because of their way of living, but the man is waiting for the woman, in spite of all disconnections. 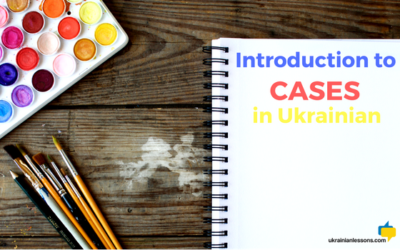 Discover the concept of the cases in Ukrainian with us. We will also give you some strategies of how you could learn them. 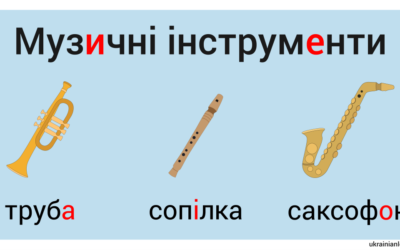 Look at musical instruments in Ukrainian – музичні інструменти! Listen to the pronunciation below and learn the words with Ukrainian Lessons picture. Practice your Ukrainian pronunciation with rhythm and fun! 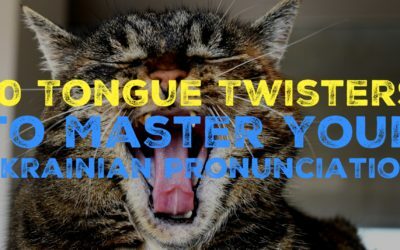 Try out Ukrainian lessons collection of скоромовки – tongue twisters! Щедрівка is a traditional Ukrainian song, which people sing on Щедрий вечір – Generous Eve. 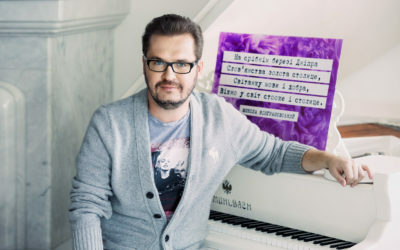 Listen and read the translation of щедрівка. Learn different parts of the body with us! You will easily understand the body in Ukrainian looking at the picture. Listen and repeat the words. Let’s talk about winter – зима! 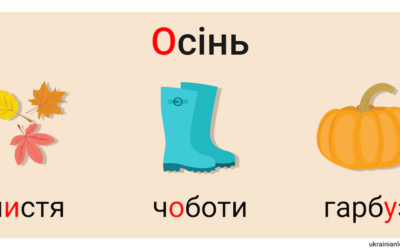 Here is winter vocabulary in Ukrainian, which will be helpful for you these months. 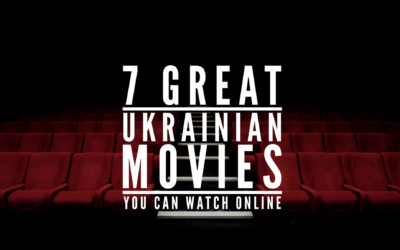 If you want to master your Ukrainian language or just learn more about Ukrainian culture, here are 7 great Ukrainian movies. We have found them online for you! Take a look at our map of a town in Ukrainian! 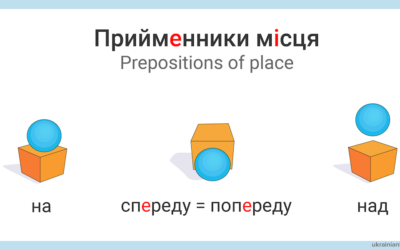 Find buildings and places in town, do you know these words in Ukrainian? Drill your pronunciation too. Learn the days of the week in Ukrainian with us today! Do the pronunciation part – listen and repeat after the native speaker. Enjoy learning Ukrainian! 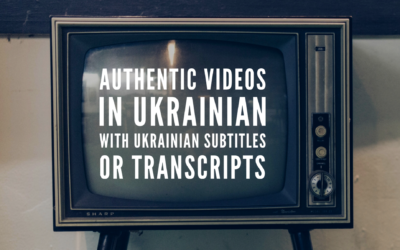 We publish Ukrainian songs with translation so that you could discover Ukrainian modern culture and practice your listening skills. Tell us about your hobbies in Ukrainian! 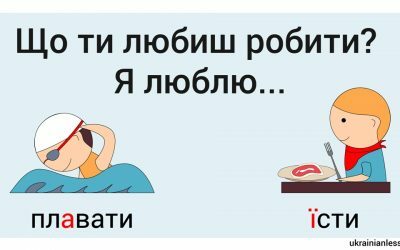 For this, you only need to use “Я люблю” + the infinitives. 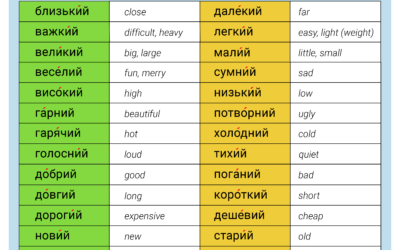 Learn plural of nouns in Ukrainian with this table. Can you think of more examples for each rule? Write down in the comments! 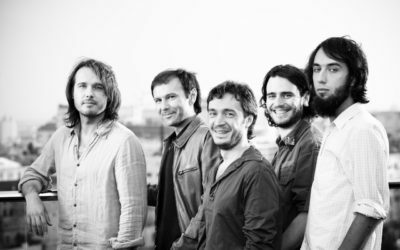 Okean Elzy is probably the most famous Ukrainian band. 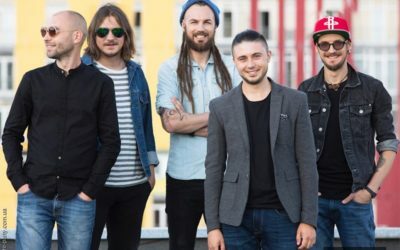 We have translated one of their songs to English so that you could discover Ukrainian culture and practice your Ukrainian with music! 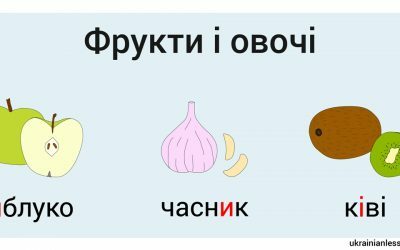 See the pictures and the translation and pronunciation of fruits and vegetables in Ukrainian. Який ваш улюблений фрукт? What is your favorite fruit? 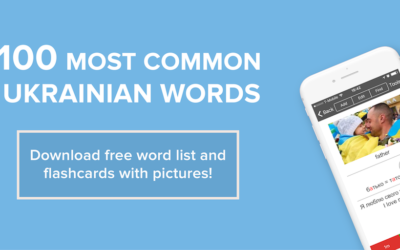 Do you know all the words for the family members in Ukrainian? Check the family tree that and review the vocabulary related to the family in Ukrainian. Numbers is one of the first things you need to know in any language. 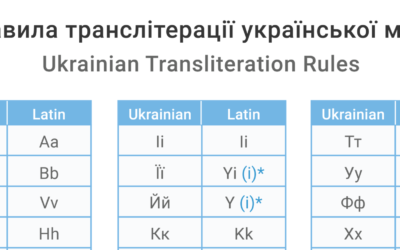 Learn or review all the numbers in Ukrainian with Ukrainian Lessons! Listen and repeat. Do you like sport? 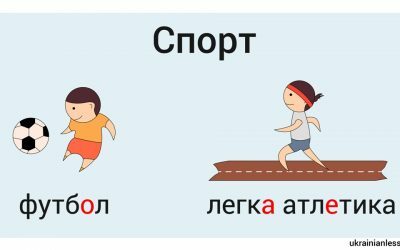 Learn popular types of sport in Ukrainian. Practice your pronunciation with us! Який спорт вам подобається? What sport do you like? it is always necessary to have a dictionary, because the more words you know, the more communicative you become. Today we will tell you about the most effective and popular dictionaries and show where to find them. 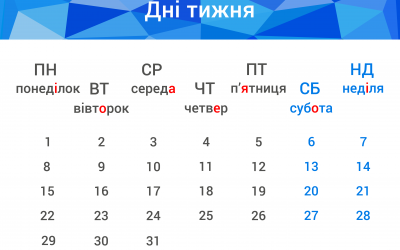 Learn or practice the names of the months in Ukrainian. They sound different from many other languages, but each of them has a meaning related to nature. Learn the names of the most popular drinks in Ukrainian with us! See below the word list and pronunciation of the words. Ви любите більше чай чи каву? Do you want to know the names of the seasons in Ukrainian? 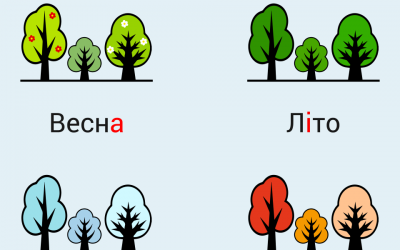 Learn how to say spring, summer, autumn and winter in Ukrainian. Яка ваша улюблена пора року? 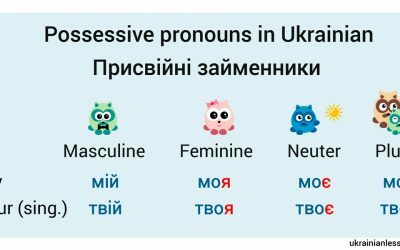 Ukrainian personal pronouns (особові займенники) are straightforward. 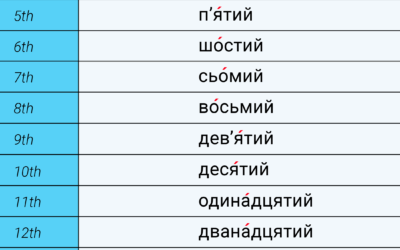 Find the list of all personal pronouns in Ukrainian below with pronunciation. 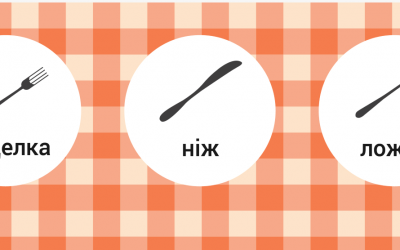 Learn how to talk about different things on the table in Ukrainian and get ready to fresh борщ and вареники! Check the native speaker’s pronunciation of these words below. Listen and don’t forget to repeat. Смачного! 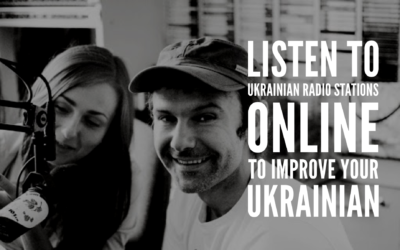 Discover the ways you can use Ukrainian radio online for practicing your Ukrainian and get links to the best Ukrainian radio stations online. How to say car, train or bus in Ukrainian? 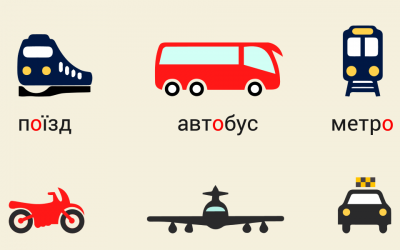 Check if you know these види транспорту – types of transportation in Ukrainian! 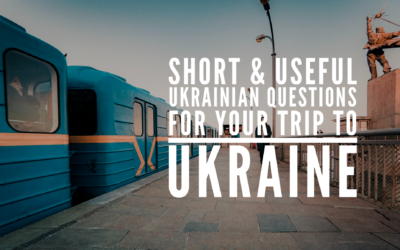 Are you going to Ukraine for travel or business? 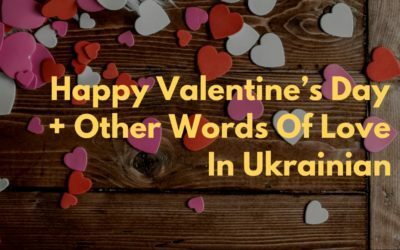 Don’t underestimate the power of the native language, learn at least 14 basic Ukrainian phrases and make Ukrainians fall in love with your accent! What languages do you speak? English, Spanish, French?.. 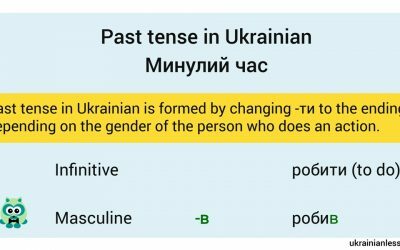 Be unique and learn Ukrainian! This language is modern, wide-spread and dignified. 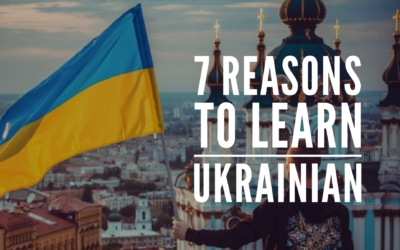 Find out 7 more reasons to learn Ukrainian language and start today! Яка погода? – What is the weather like? 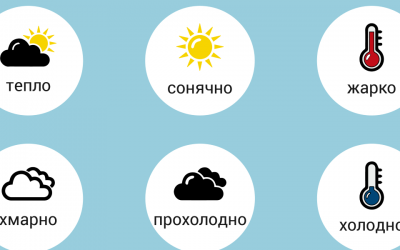 Learn how to talk about the weather in Ukrainian! And share with us: what’s the weather like in you city or village? 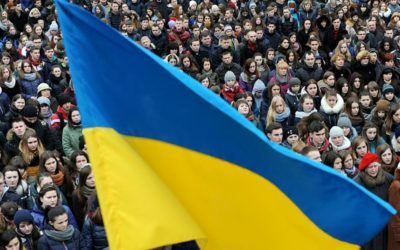 – Яка погода у вашому місті чи селі? Didn't find what you were looking for? 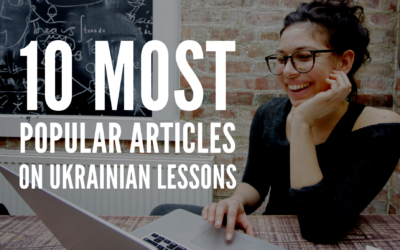 Let us know what articles you want to read about learning Ukrainian! Thank you! You have successfully subscribed to Ukrainian Lessons Podcast series. 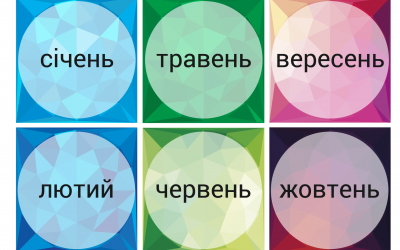 Ukrainian Lessons Podcast is a free series of podcasts in conversational Ukrainian for beginners. 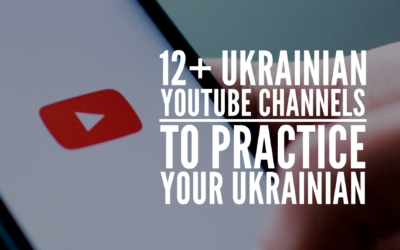 Subscribe here to get free Ukrainian Lessons Podcasts every week!